I decided to tackle the custom domain name setup again for Google Custom Domain names for both Blogger and Google Apps. The instructions for setting up a custom domain name with Blogger seem simple enough, but when entering a CNAME record and having the WWW point to ghs.google.com produces only half the desired results. Here is an actual example of what I am talking about. When entering www.wednesdays.ws, that takes you to one blog. But when entering just plain wednesdays.ws, it would say the blog could not be found or something like that. So I decided to see what would happen if I created a second blog, and using the custom domain feature to point this second blog to a nearly identical template, but with different blog postings. Now both blog sites work independently of one another. Take a look at wednesdays.ws. The Blogger system allowed for independent blogs on both the www and without the www. 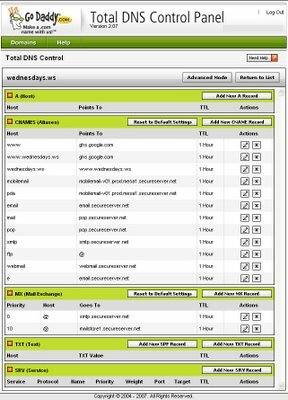 This really is not an ideal setup because most people think of www.wednesdays.ws and wednesdays.ws as one and the same site. However, the WWW is actually a subdomain of wednesdays.ws. In the Blogger Help Group is a thread for Custom Domain. This particular thread talks about the very problematic issue, and unfortunately does not appear to have a fix at this time. I can’t help but think that there has to be some enterprising individual that has come up with a definitive answer to this CNAME record problem. Apparently, CNAME records are suited for subdomains and not the domains themselves. Here are a couple of articles that talk about the details of what is required. The interesting thing about CNAME records being for subdomains, is the fact that I was able to publish two different blogs using WWW for one and no WWW for the other. 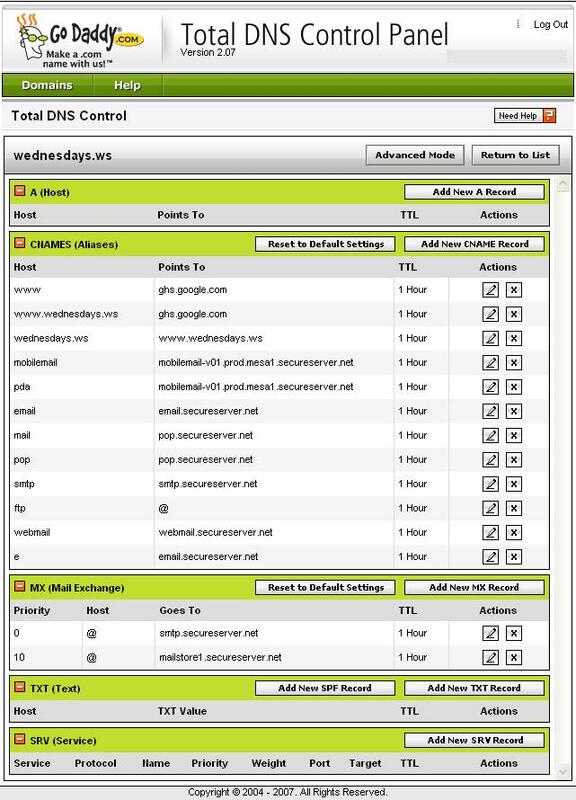 Below is the actual GoDaddy Total DNS Control Panel screen shot. Click on the image to open it in a new window, with a larger view. This has not been the only experiment with Google and the Custom Domain Names. Several months back, I had set up this website with a custom domain name and used both a blog for publishing, plus bring your own domain name at Google Apps. This was exceptionally interesting in the aspect that the WWW was being published at the blog, and the other without the WWW was being published at Google Apps. This does seem to work, but in my estimation is confusing for the person browsing from one location to another, even though technically the WWW is a subdomain, most people do not realize that, and expect to go to the same place no matter which way they type in the domain name. I am not exactly sure how the search engines take to having each go to a different location. On one of the experiments, I believe I was able to get it to partially function, except the articles themselves would not render properly. If the article posting was being published using the WWW blog, then when someone tried to type in the article location without the WWW it would not find the posting. Since that time, with the two different locations option, I have switched this website to publish with ftp publishing using Blogger as the Blogging engine. With ftp publishing there is an option to turn off the Blogger tool bar. Now, because the site is hosted at another location, both the WWW and the site without the WWW render to the same web page. Here are some other items I tried to see what would happen to try to alleviate the problem of dual personalities with Google Custom Domain name publishing. I located the IP address for where the particular blog was being published. I then created an “A” record which pointed to the location of the blog. I don’t remember all the particulars of exactly what happened, but I do remember there were performance issues. Additionally I tried to do a Meta Redirect in one of the blogs to go to the other. This also had performance issues, and the search engines probably penalized the website for having a meta redirect with little time involved before the page was redirected. Also, having a redirect places the person using a web browser, who wants to use the back button, in a position of not being able to easily get back to his or her starting point. Simply put, people do not like being hemmed in and not able to get back in their browser. So, that option was not ideal. There has got to be an answer. If I only wanted to have a unique blog subdomain name on the front of my website, then using Google Custom Domain name publishing is no problem at all. Any suggestions from anyone? Google, do you folks have any answers?